This entry was posted on June 1, 2015. Bookmark the permalink. It’s been a busy year or so for me and my business! So much so that I realised I haven’t posted a blog for..erm…over a year (I know!). Change is on the horizon for my work life though. My daughter starts school in September, meaning that I will be able to spread my studio time across the week rather than cramming it into the spaces childcare allows. I’m hoping this will mean more time for design development of new work, and hopefully that I can keep on top of all the admin side of running the studio a bit more efficiently (and yes, manage a more frequent blog!). So, full of good intentions – here is my first post for a long while! You can always catch up with the day to day studio news on my Facebook page too. 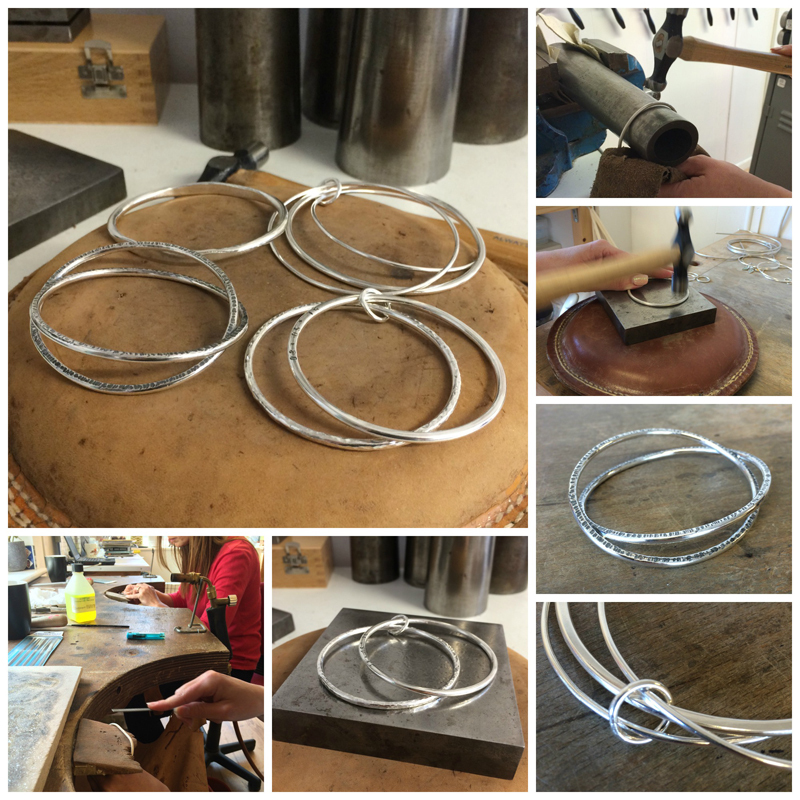 This weekend at the studio I ran a beginners bangle workshop. This one was an extra to the usual timetable of weekend classes I run each term. I’m always happy to run an extra class, and it’s often nice to teach a group of friends who are enjoying a get together as well as learning some new skills. As you can see from the collage below, everyone did a great job. I think the hardest part was for everyone to decide what style of bangle they were going to make! Four lovely pieces of jewellery that started out as piles of different sized wire and became beautiful bangles via annealing, soldering, shaping, hammering, filing, stamping, oxidising and polishing.